Browse the new National Blues Museum — where you can even join a jug band! — with a fellow music fan. St. Louis has always been a big blues city, and now we get our due with our own National Blues Museum, which hosts live music. Party central would be our Soulard neighborhood, which boasts 20-plus bars, with live music going seven nights a week. In the 700 block of Broadway in Downtown, there are three great live music venues where you’ll hear the blues, rockabilly, funk and soul. 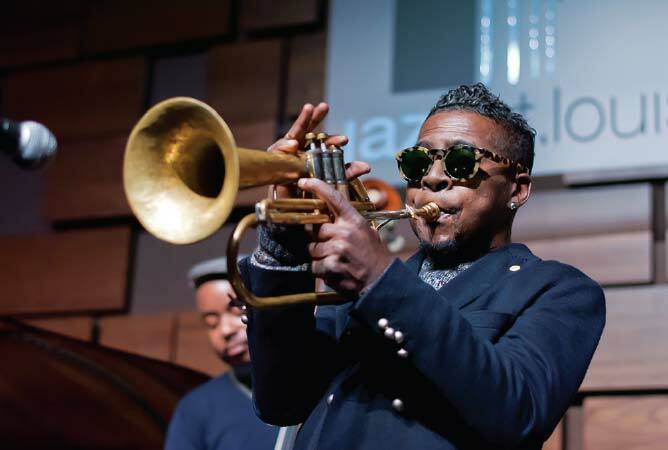 Miles Davis first blew his horn in our jazz clubs and today, we have upscale listening rooms along with classy restaurants featuring duos and trios playing inspiring jazz all over town. Then there’s our roots movement, so get on the dance floor and dance to folksy Americana from the 20s, gypsy jazz and 1940s swing acts that will knock your socks off. Hail, Hail, Rock ’n’ Roll you say? Chuck Berry lives and performs here! And from classic rock to the alt-rock stylings of another homegrown treasure, Wilco, we have fantastic museums playing every kind of rock. Country, hip hop and sure, even death metal—why not? At the other end, we have the second oldest symphony in the country and an opera company that garners deserved rave reviews. Discover more than 50 clubs, interactive event calendars and locations. Come on, get happy.